What do you think of, in terms of food, when you go to IKEA? I can only think of Swedish meatballs with mashed potatoes, gravy, and lingonberry jam! 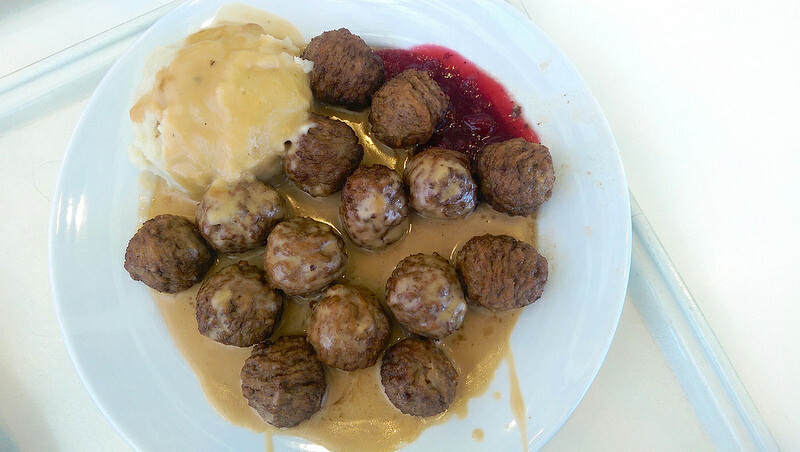 I ate my meatballs together with the mashed potato, gravy (I asked for an extra scoop), and lingonberry jam. Yummmm! However, it came with food coma… To alleviate that, I walked around IKEA with a coworker before heading back to work. If you plan on eating and shopping here, be sure to hit the cafeteria-style restaurant first! In Sweden, köttbullar (meatballs) are made with ground beef or a mix of ground beef, pork and sometimes veal, sometimes including breadcrumbs soaked in milk, finely chopped (fried) onions, some broth, and often including cream. They are seasoned with white pepper or allspice and salt. Swedish meatballs are traditionally served with gravy, boiled potatoes, lingonberry jam, and sometimes fresh pickled cucumber. Traditionally, they are small, measuring one inch in diameter. When Charles XII of Sweden was in exile in Istanbul in the early 18th century, he took the recipe back to Sweden.